Intel’s (NASDAQ:INTC) much expected consumer version of its Patsburg chipset appears to have been christened and rather than going with the logical move of calling it X68, Intel decided to call its new baby X79. This somehow seems to make sense considering we’ve got the upcoming Z68 chipset coming and presumably in a move to reduce the confusion to a degree, Intel decided to come up with something different that didn’t follow its current nomenclature. The X79 chipset is still en route for a Q4 launch alongside Intel’s new LGA-2011 Sandy Bridge-E processors where the E stands for Enthusiast according to the leaked roadmap slides that appeared on it.com.cn. The slides look legit, although to be frank, we’re quite surprised at some of the features Intel decided to add to its enthusiast consumer platform. One thing is clear if these are the final specs, the X79 chipset is going to be the most expensive consumer chipset to date from Intel. As we’ve already known, although not explicitly mentioned the X79 chipset will support PCI Express 3.0, although we don’t know the exact lane count on the Sandy Bridge-E SKU, upcoming Xeon’s will have a total of 40 lanes. What is clear is that Intel has designated 32 lanes for graphics which can be in either a two x16 or four x8 configuration. 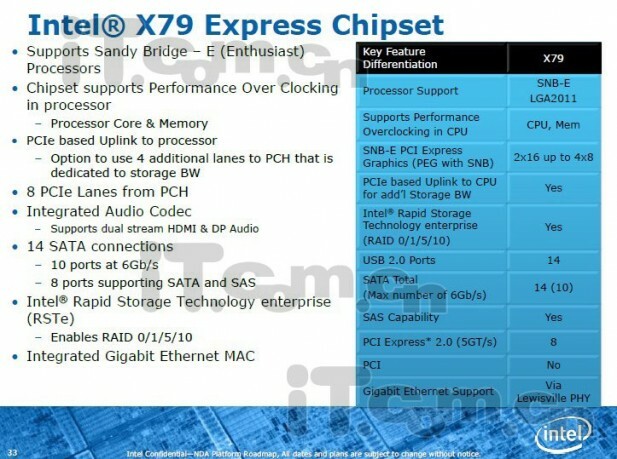 Judging by the slide, we’re also looking at support for additional lanes, as the X79 chipset has a feature listed as “PCIe based Uplink to CPU for add’l Storage BW” which is the same feature offered on the Patsburg-D/-T SKUs and this is using four lanes worth of PCI Express 3.0 bandwith. This also means that we’ll be seeing four SATA 3Gbps ports, two SATA 6Gbps as well as an additional eight combo SATA/SAS 6Gbps ports. This is to our knowledge the first time Intel has added SAS support on a consumer platform. This is also a way for Intel to get around the limitation its current SATA implementation, although the SATA/SAS SCU has no way of interfacing with the AHCI ports. This also means that it works like a separate controller, although being able to RAID up to eight drives should be enough for even the most extreme users. Judging by the RAID implementation which supports RAID 0, 1, 10 and 5 we’re actually looking at a version of the Patsburg-T SKU which is the premium model in Intel’s server and workstation line-up.